Well, it's TCP Tuesday and it's also time for a New Release Holiday Blog Hop to show off the 5 new Clearly Swanky stamp sets, new Holiday Glitzy Glitter and new buttons that The Cat's Pajamas will be releasing tomorrow, the 10th. Since I'm the Hipster Hostess with the Mostess, the Hop starts with me! But first shall I go over what this week's stamp challenge is? Since we're already getting into the holiday spirit with these new sets, the challenge will be to use any TCP stamps to celebrate any December holiday, up to and including New Year's Day. 1. All challenge entries will go into the monthly Swanky Stamper contest. That means $25 in Cat's Cash to spend on new stamps at The Cat's Pajamas. 2. Since this week's challenge is a STAMP Challenge, TCP stamps are required. 3. Link your card to Alma's blog, which really means you'll be uploading it into her guest book/slide show (cool and easy, remember?!). Now, how about a little about my card? 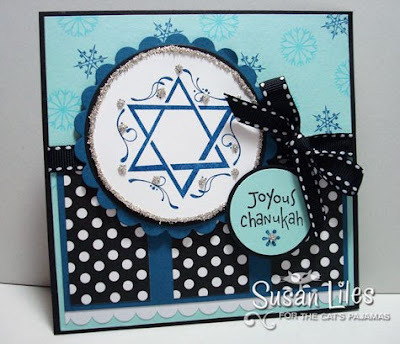 I used the new Shine Bright Clearly Swanky set to make this Joyous Chanukah card. Is there something in one of the pictures you've seen before? Yep, I made it to match the little dreidel I showed ya'll HERE a couple of weeks ago. Well, actually, I made the card first and then the dreidel, but decided to hold off on showing the card until now to make it be for this Holiday Hop! I used some of the new Holiday Glitzy glitter around the circular piece and it's super sparka-lay in real life! I love this set, and even though we don't celebrate Chanukah, there's still a few images in it that are wonderful for other types of holiday cards. Ok, so are ya'll ready to be WOWED by all the cuteness of these new sets? Ya'll are going to want ALL of them!! They are my favorite TCP stamps so far! Head on over to Toni's blog, Moved to the Mountains . Thanks for hopping along! SUSIE Q-TIP: Ok, so I don't really have a tip, but knew that ya'll would look here. (Teehee--I've got ya'll trained!) Remember back on my dreidel post, I was having a little contest for two of ya'll to win a copy of the latest issue of Paper Crafts? Did ya'll not wonder who ever won? I decided to wait until now to chose the winners! My question was for ya'll to guess what I had put inside my dreidel. Several of you guessed candy, gold coins, stamping stuff, chocolate and even money. No one got it completely right--Hershey Kisses!! So the girls just randomly drew two names and they are: Lara and terriavidreader! If you two girls will email me with your addresses, I'll get these in the mail to you. Congrats! 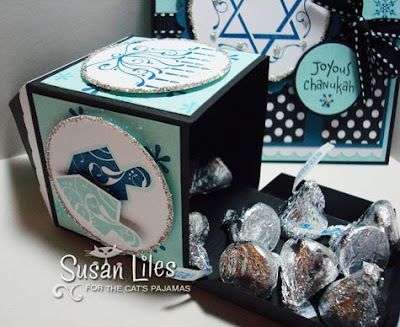 Oh Martha, I mean Susan--the dreidel box is super duper, and the snowflakes on the Chanukah card are perfect! This is simply STUNNING!!! I am beyond blown away!! Simply gorgeous!!! Beautifully !!! love the dreidel. I love your card, the colors are beautiful. I bet a little kid would love to get that dreidle. Love the project you created :)! Fabulous little gifty set, Susan! Love the color combo and all the glitz! Very fun, Susan...I thought this was genius from the get go....and that candy can project below...FAB! 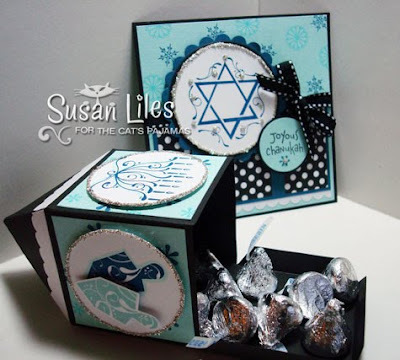 Susan, I love your festive Chanukah card and dreidel! I have a close friend who celebrates Chanukah, and I'd love to surprise her with something special like this!! Thanks for the inspiration! I love your dreidal! So sweet (groan, go ahead). Wonderful! I'm always on the look-out for great Chanukah ideas! Great Driedal gift box idea, so cooL! Wow. Those are great. I definitely need the Chanukah set! Susan, these projects are beautiful! But the dreidel box is outta sight with creativity! High Fives! This is so creative and absolutely fantastic!! Loving this new release!! !